Saint Colette is a suitable patroness of those blessed by the instability of a holy restlessness, by insatisfaction, and by the burning desire to correspond to Divine Grace. 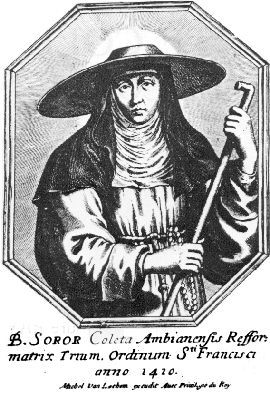 Her spiritual journey led her from the Béguines to the Benedictines, from the Benedictines to the Poor Clares, from the Poor Clares to reclusion in a cell as a Franciscan Tertiary, and from her solitude to a mission of reform as an itinerant Poor Clare Abbess! Born at Corbie on January 13, 1381, Saint Colette’s parents named her Nicolette in honour of Saint Nicholas the Wonderworker whom they had invoked in their great desire to have a child. Orphaned at eighteen years of age, Colette obtained permission from her guardian, the Lord Abbot of a nearby monastery, to enter the Béguines of Amiens, in spite of her young age. Béguines were, as a rule, women of a mature age. Colette stayed with the Béguines for a year. She found their life too soft. Then she tried Benedictine life. There too, Colette wasn’t satisfied. After the Benedictines, Colette entered a monastery of the Poor Clares. Even among the daughters of Saint Clare, she longed for something else. Her spiritual father finally had her pass, as a last resort, from the Second Order of Saint Francis (Poor Clares) to the Third Order. As a tertiary, Colette became a recluse. Had Colette found the place of her spiritual rest? Hardly. God called her out of her reclusory to reform the Second Order of Saint Francis, the Poor Clares. Colette encountered Pope Benedict XIII who, during the troubled period of the Great Western Schism, reigned from Avignon. In 1406 Colette traveled to Nice to meet again with Pope Benedict XIII, temporarily in residence there out of fear of the plague. She asked his blessing on her project of reforming the Poor Clares. On October 14, she made monastic profession in the presence of the Pope and, in this way, entered the Second Order of Saint Francis. Benedict XIII named Colette, “Lady, Mother, and Abbess of the Reform in perpetuity.” Abbess Colette’s privileges were confirmed by Pope Innocent IV once the Western Schism had come to an end. Saint Colette was an Abbess on the road. Ceaseless travels allowed her to impart a flame of spiritual renewal to monasteries of both nuns and friars that had grown cold in compromise. Among the monasteries of nuns founded or reformed by Saint Colette are Besançon (1410), Poligny (1417), and Amiens (1443). Saint Colette died at Gand on March 6, 1447. She was beatified in 1623, and canonized in 1807. 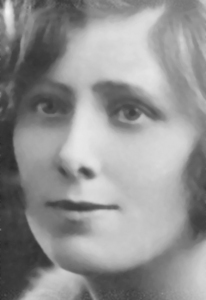 Among the saintly daughters of Saint Colette is the Venerable Margaret Anne Sinclair (1900-1925), born in Edinburgh and professed in 1925 as a Colettine Extern Sister under the name of Sister Mary Frances of the Five Wounds. She died in London in the year of her profession on November 24th. In the United States, the beautiful Bethlehem Monastery of the Poor Clares in Barhamsville,Virginia, together with several other monasteries of the same Federation, represents the Colettine tradition of Poor Clare life. 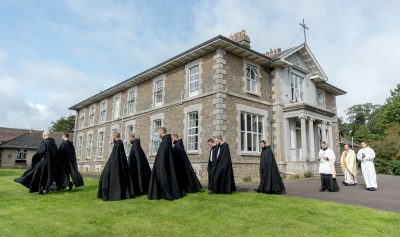 In Ireland there are Colettine Poor Clares in Carlow, Cork, Dublin, Ennis, and Galway. Visit their website here.